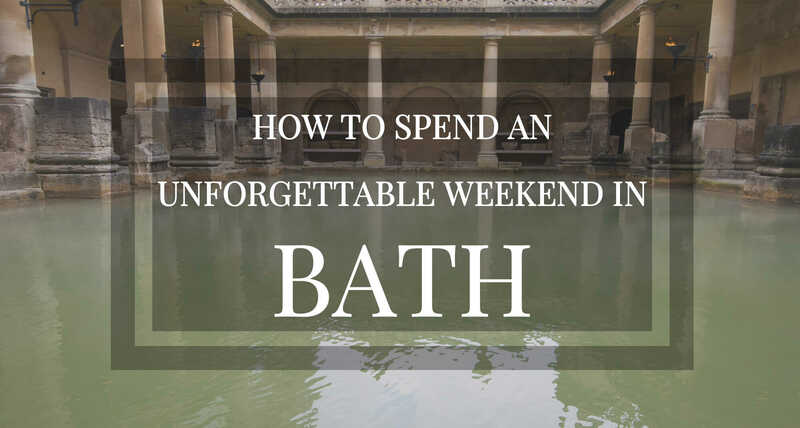 With this new post of our series “How To Spend An Unforgettable Weekend In…” we want to tempt you with an opulent weekend in Bath, England! They arrived in Bath. Catherine was all eager delight -her eyes were here, there and everywhere as they approached its fine and striking environs, and afterwards drove through those streets which conducted them to the hotel. She was come to be happy, and she felt happy already. But Bath is far more than Jane Austen. It is not usual to find such a perfect balance between ancient and contemporary history, architecture and wellness in a single place. Let alone such a good deal of local and international restaurants to satisfy even the most sophisticated palate. And you can enjoy everything in a weekend! What else can you ask for? But before starting let me get a little practical for a couple of seconds. After some planning, we decided to enjoy the traditional English hospitality and stay in a bed & breakfast while in Bath. For that, the property of Gretta immediately popped out as recommended in a quick search in Airbnb. That together with its location and gorgeous views of the city made us decide and click the Booking button. 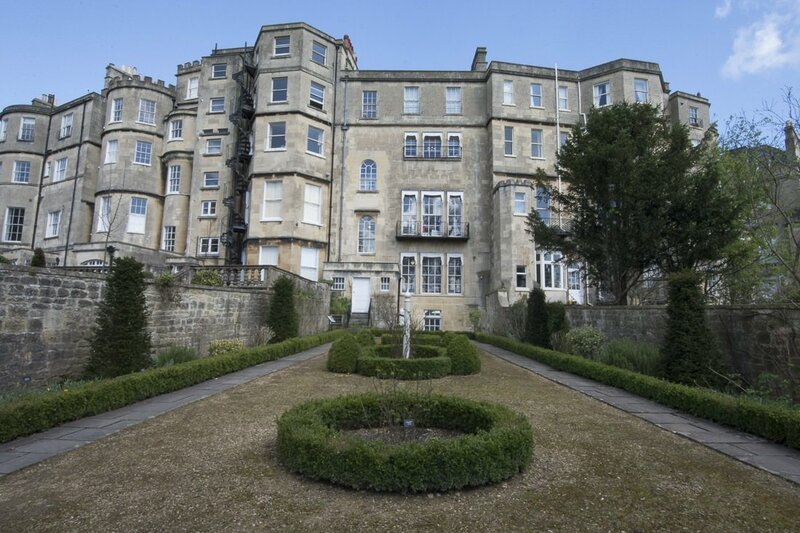 Of course, there are many other accommodation options in Bath. Try the regular sources (bookings.com, TripAdvisor.com,…) and start planning your next unforgettable weekend in Bath right now! 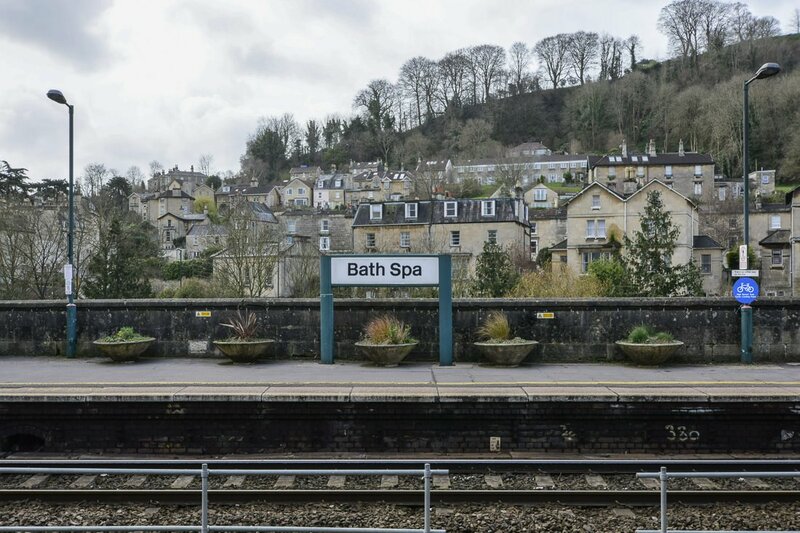 Bath is best reached by any of the train services stopping at Bath Spa Railway station. You can reach town in one hour from Bristol Airport and in just over two hours from London Heathrow and Gatwick Airports. Not sure what train to catch? Head over to National Rail to plan ahead. A coach is also an option, with regular services to Bath -check National Express or Traveline South West for connections and prices-. Now that you know how to get to Bath and where to stay you’re all set to start. That’s what we squeezed into our weekend and what you can do too if you follow this plan as inspiration. Waking up at 5am on a Saturday morning is never that rewarding. Unless it’s to travel back in time to Stonehenge. Who? When? Or even why were those megalithic stone circles put together? Were they part of an enormous calendar or a more exotic device? Don’t expect to find any explanation there. The grandiosity of those perfectly carved stones will suggest more questions rather than answers. Instead, enjoy the sight of such a wonder. The best way? 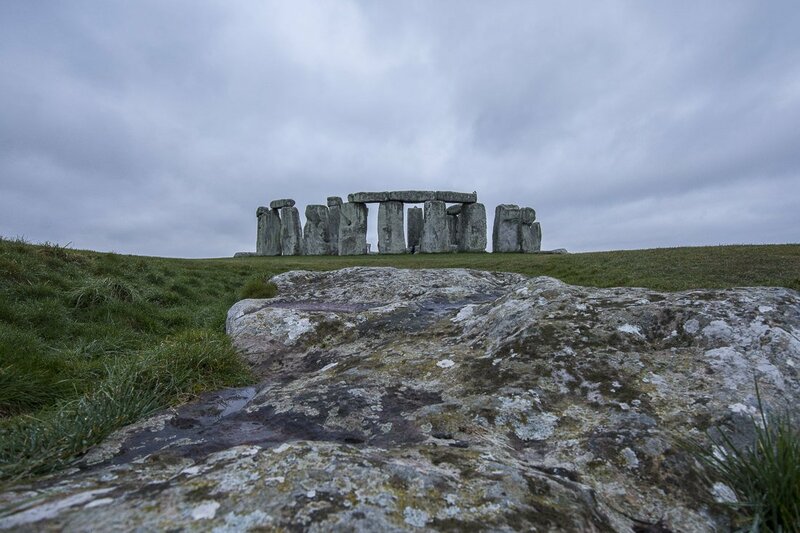 During a private sunrise or sunset tour in a reduced group and inside the circles with Stonehenge Guided Tours. If you’re as lucky as we were to get Nick as your guide, you will wonder whether time runs faster the closer you’re to the stones. He is incredibly knowledgeable and passionate about the history of the area and will make your experience even more enjoyable. Book ahead and take some friends with you, as prices are quoted per car. Maybe because of the fresh air of the English countryside or just because we didn’t have breakfast that early in the morning. For whatever reason, during our drive back to Bath we couldn’t think of anything else other than a sumptuous brunch. After some wandering around, we went into Cafe Retro, also a recommendation from Nick. 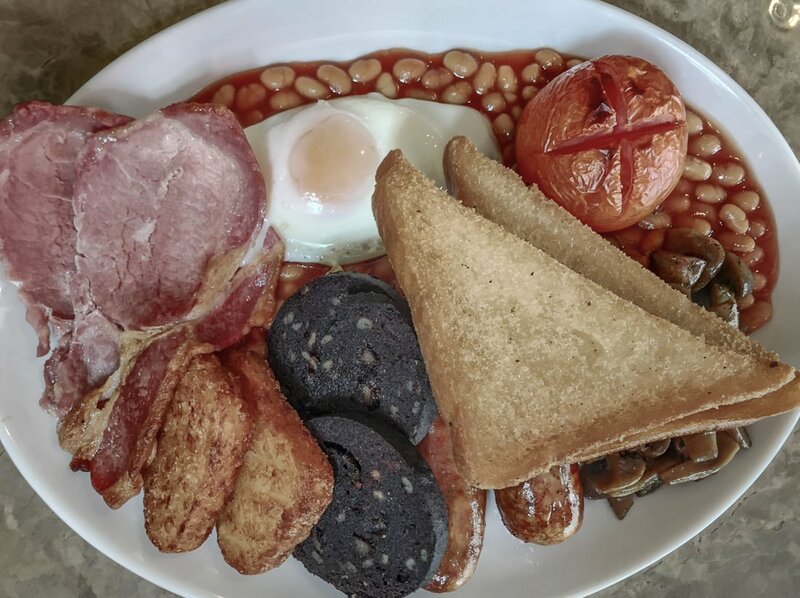 If you’re super hungry (and non-vegetarian *wink*) be bold and try the Big Breakfast, a traditional English breakfast with the lot. They also have an excellent make-your-own hot chocolate menu. And serve breakfast till noon in case you cannot find your way out of bed earlier. With full bellies, it was time to start exploring the town centre. 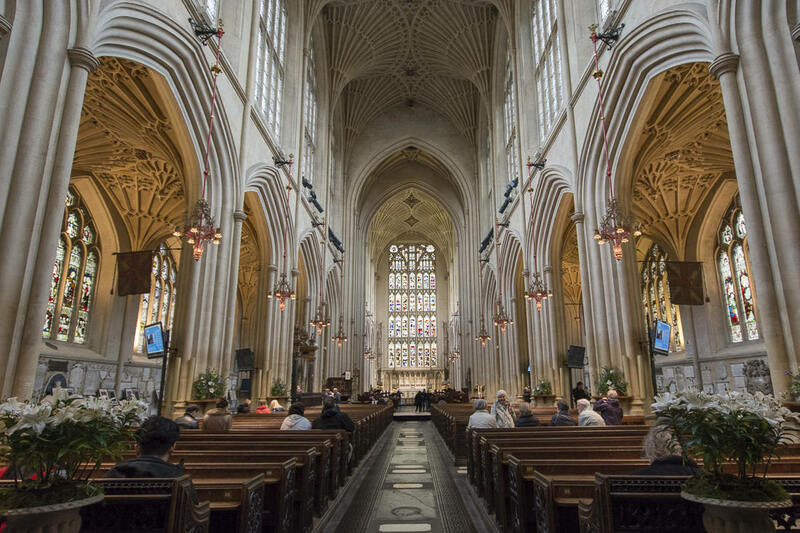 As the main square is just around the corner from Cafe Retro, we chose to visit Bath Abbey first to satiate our thirst for churchy art. They recommend a £2.50 donation, it is well worth a visit. When you’re back outside, don’t forget to admire the stone carvings on the facade of the bell towers. Try to spot the angels descending from the heavens, heads first. Just across the street, the Roman Baths were our next visit. The Romans knew what they were doing when they settled in the valley of the Avon River in the 60ADs, attracted by the numerous mineral hot springs. After them, the hot springs have lured every civilisation to the area for varied reasons until today. Either for sacred or more leisurely purposes. In fact, the buildings at street level dates from the 19th century, with the actual Roman and middle age structures mostly underground. The £15 entrance fee includes an audio guide that will walk you through the history of the place. At the end of the circuit, there is an opportunity to drink the medicinal waters. Although chances are the sole rancid smell will deter you from even pouring yourself a glass. 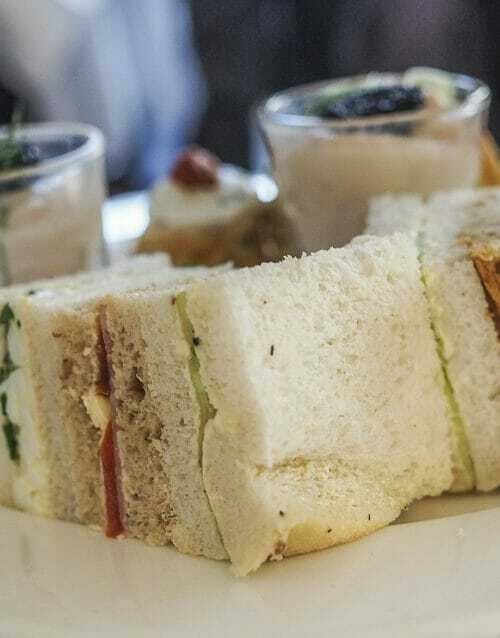 After emerging from the hot and steamy catacombs of the Roman Baths, the logical next stop would have been The Pump Room for high tea as both places are connected through a short classily-decorated alley. However, the pompous breakfast we had at Cafe Retro still felt too recent in our bellies for that. Instead, we wandered out and around until the sweet smell of freshly made fudge brought our feet to a sharp stop right in front of the window of the Fudge Kitchen. While there, watch them prepare the candy in front of you. Go ahead, taste a sample and of course buy some from about £5 each portion. We bought some for later, dairy-free salted caramel and chocolate classic for myself and peanut butter with chocolate swirl and white chocolate for Michelle. Can’t you tell already we both suffer from severe cases of a sweet teeth? Bath is also a sublime place for shopping. Not only all the standard chains but also some unique hidden gems can be found in Bath. Books, attire, home decoration, antiques, jewellery, pastry and food specialities… too much to choose from but well worth a browse all the same. And that’s a huge statement coming from me as I’m not an assiduous shopper, I’m sure Michelle can confirm this point to anyone not believing me *wink*. To end an activity-packed day we needed a good dinner seeing as we skipped lunch. And what better way than Italian to break the monotonous fish-and-chips-based diet of the casual visitor to the U.K.? Jamie Oliver, the renowned celebrity chef, has a good restaurant in Bath, Jamie’s Italian Kitchen. Expect pasta, pizza, meats and other Italian staples outstandingly executed, and a cocktail menu worth exploring (our personal favourites, the Lychee & Rosemary Sofia and the Amalfi Collins), with prices on the high side. After a light breakfast of tea and toast with butter at Gretta’s, our Sunday in Bath started with us heading to the Abbey Churchyard to meet our fellow tour-takers. Before coming to Bath we heard of the famous free Mayor’s walking tour and wanted to see what all that fuss was about. Even if pouring with rain John, our energetic guide for the morning didn’t have any objection to going ahead with the visits. This tour gives you a good insight into the Georgian history of Bath as well as a brief review of pre-Georgian times. You delve into the lives of two of the main characters/influencers/game changers of the time (the 1700s Master of Ceremonies, Beau Nash and John Wood, the architect behind the Royal Circus and the Crescent). 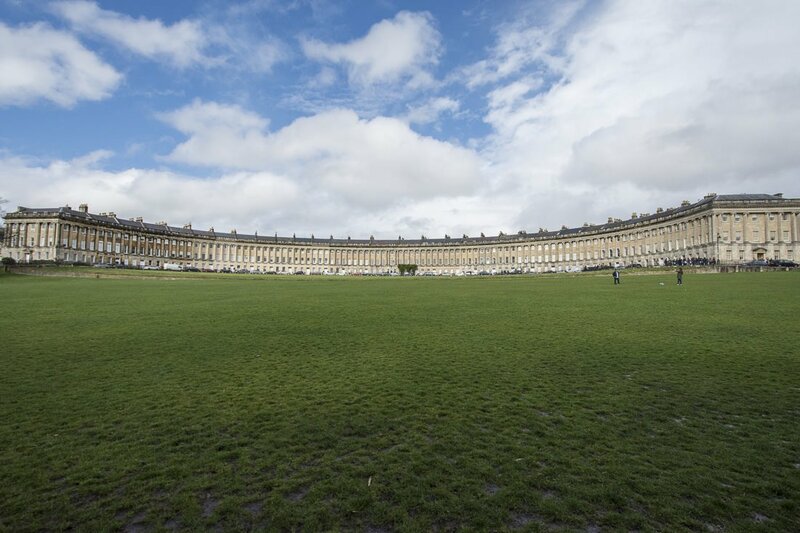 It takes you to all main sites in the city centre, including The Crescent, The Royal Circus, The Assembly Halls, Pulteney Bridge and all of the other architectural delights that Bath has to offer. You don’t go inside The Roman Baths or The Abbey though but do learn lots of their history. 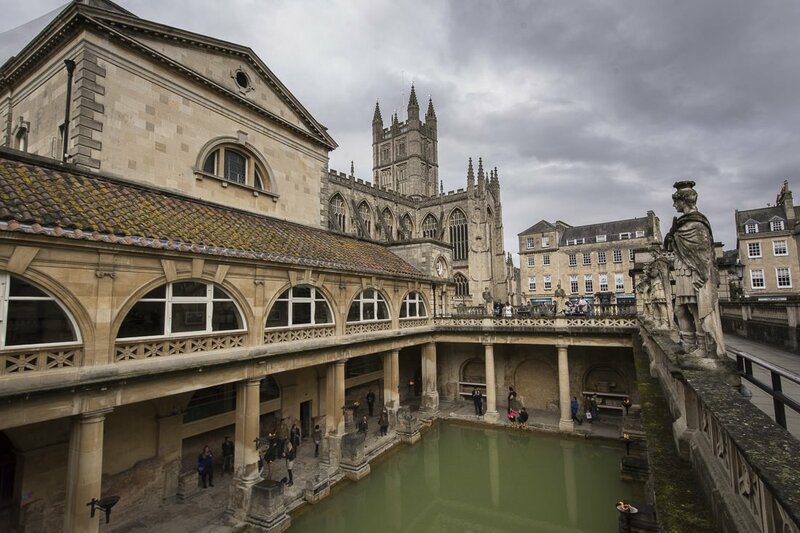 Any of the guides leading this tour will make you feel like in the old-times Bath. And if you pay attention hard enough while wandering the streets of this historic English town you will still hear the footsteps of porters carrying their obscenely overweight master in his sedan chair back home in the evening after taking the waters in the foul-smelling pools of the resort, up the sloped winding streets of Bath. And if you’re a bit more patient you’ll also hear how, once at the entrance of his multistorey Georgian manor, a knock on the door will grant the already panting porters the pleasure to further carrying the lord of the house (and his robes still dripping) up the narrow stairs into the comfort of his room in the top-most floor. Two hours and barely three kilometres later we were back in the Abbey Churchyard, it was time to part with John and our fellow tour party and immerse ourselves even deeper in one of the best known English traditions: High Tea. 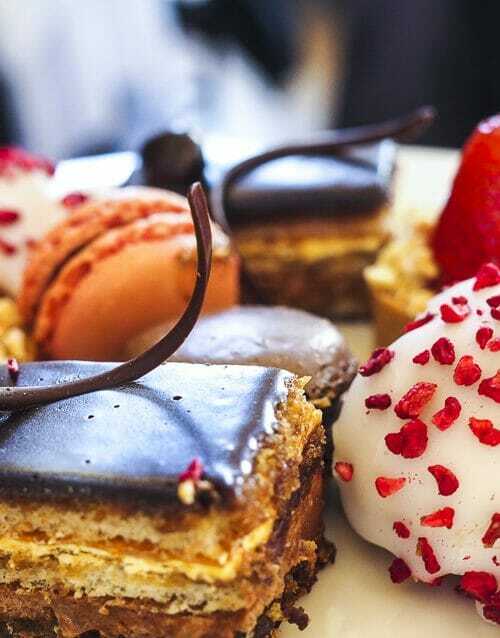 And where else better for high tea in Bath than in The Pump Room? 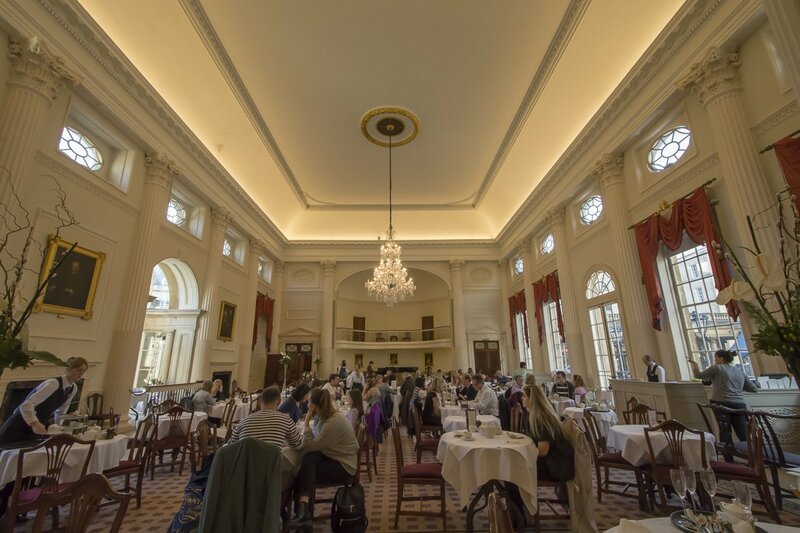 High Tea at The Pump Room is a tradition going back to the 18th century as a way to socialise, meet people and possibly find a suitor. For us, it was a deliciously extravagant way to transport ourselves back in time to the days of Jane Austen. 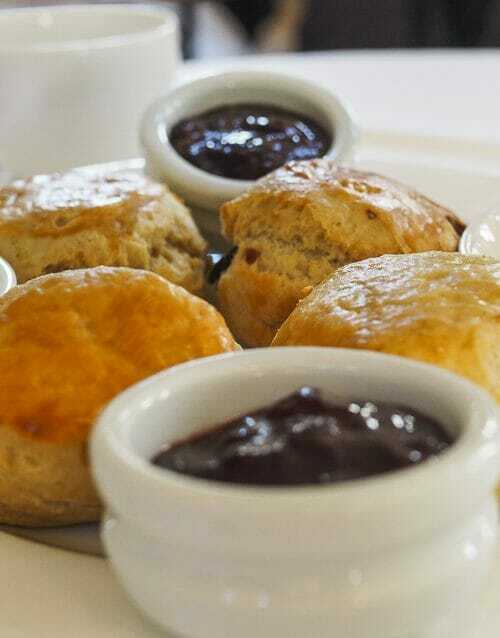 The grandness of the assembly room and the background music of the string triplet or piano playing at that time was the perfect setup to delight ourselves in that tower of sweet and savoury delicacies, and scones with strawberry jam and clotted cream accompanied with a pot of jasmine tea. 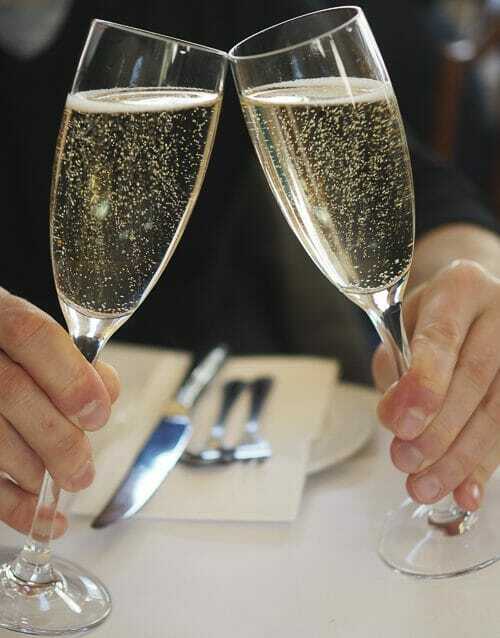 And of course with a glass of champagne because there is always time for some bubbles, wouldn’t you agree? Bear in mind, The Pump Room is a rather popular place, and on weekends they do not take reservations. That being so, you might be politely asked to wait for your turn to be seated. If that discourages you let me tell you right now that all waiting it’s worth it, I give you my word. Another enjoyable way you can indulge yourself while in Bath (and possibly the most obvious one of all) is by soaking in any of the naturally heated thermal pools at Thermae Bath Spa. For centuries the geothermal waters of the springs in Bath had been openly available for public use. However, in the late 1970s they were decreed unsuitable for bathing due to public health reasons. Roughly 30 years later, Thermae Bath Spa opened its doors just around the corner from the old Roman baths as a somewhat controversial project. Today they offer four floors of relaxation with access fees starting from £37 on weekends. Of course, we tried this pleasure too. And started in the open-air rooftop steamy pool at sunset with gorgeous views over old Bath. Then we made our way down to the next floor. There we could enjoy four differently scented steam rooms with resting times under a centrally locate shower of hot and cold waters. Down to the basement for an indoor heated pool with jacuzzi area. The 1st floor is exclusively for massages and treatments if you feel you deserve further pampering. In Roman times it was thought the water had healing properties. I don’t know about this modern filtered version, but we certainly felt relaxed, warm all the way to our core and our skin felt very clean by the time we walked out. If this is not the best way to end an unforgettable weekend in Bath, I don’t know what is. After such a delightful couple of days, I guarantee it won’t be easy to even think about packing your bags, let alone going back home to your daily routine. 26 Comments on “How To Spend An Unforgettable Weekend In Bath”. Join the Conversation Here! Looks like an awesome travel destination! It is indeed a great town to visit! abvoe all, Bath offers an awesome delicacy cuisine. if you could have taken meal’s pic from little far ..i could have guessed how delicious it would have been . Amazing post. Well designed by amazing view point and delicious foods. Thanks for sharing. The Bath Abbey is very beautiful. Likely quiet place without a lot of tourists. I visited Bath last year and fell in love with it! Thank for sharing this post! Thank you Marcus. I completely agree! That is definitely an unforgettable weekend in Bath! I love the mix of great food and history. The walking tour sounds like my cup of tea (pun intended) because it is free. I have always wanted to visit Stonehenge and didn’t realize there was so much more to see in the area. Bath just got moved up on my bucket list. Absolutely Chris, Bath does not always get the attention that it deserves, we are glad we inspired you enough to move it up your bucket list! Bath is one of my favourite daytrip destinations, living in Bristol. It’s great for a weekend too, so much to do and see! Hi David and Michelle, we are Matthias and Mieke from Belgium and try to put as much adventure as you do during our working lives. Great to see that you had an amazing time in Bath. We recently visited Bath also during a weekend-off, we loved it! Did you drink from the water fountain at the museum? We did, but still have our doubts if it really is that healthy :p ! Anyways, great website and keep on traveling/writing like you do! It’s too lovely for words. I am definitely going to Bath next summer. Hi Andy, Bath is indeed a lovely town. Let us know how you liked it! Thanks for your comment! We had an impromptu trip to Bath a few months ago and thought it was a beautiful city. There’s a famous cycle route from Bristol that follows an old train track the whole way and was a really beautiful cycle! What were your highlights? Hi Joshua, thanks for your comment! For us, one of the main highlights was driving to Stonehenge from Bath before sunrise. Did you have a chance to go to the site? Unfortunately not, if we had one more day then we would of but it give us another reason to go back to the area. Did you get a clear sunrise? Hi, David How are you? I was in England Last year & Didn’t visit of Oxford Area. But now after reading your blog post, I would like to stay in Bath. Thanks for sharing this post, keep it up the Good Work. Hello there! You are welcome and thanks to you for the kudos. Let us know how you like Bath next time you visit! It’s great to see a post about Bath. My elder sister lives there with her family and she often sends me pictures of beautiful architectures, cathedrals, food and many more. I have never been there before but someday will go to meet my sister and I wish to roam around the city. I love taking pictures, I am sure there are tons of places like you have mentioned above in your post to see and enjoy the history. She might have told me about her going to ‘Bath Abbey’. Thanks for sharing your post and it was a great reading. Hi Paulomi, and thank you for stopping by! Bath is indeed a paradise for both history and photography lovers. We would love to hear from you again when you finally have the chance to visit! Thanks for the information. And It’s absolutely true, Bath is the paradise indeed. Great information on Bath, loved it. Will revisit again !